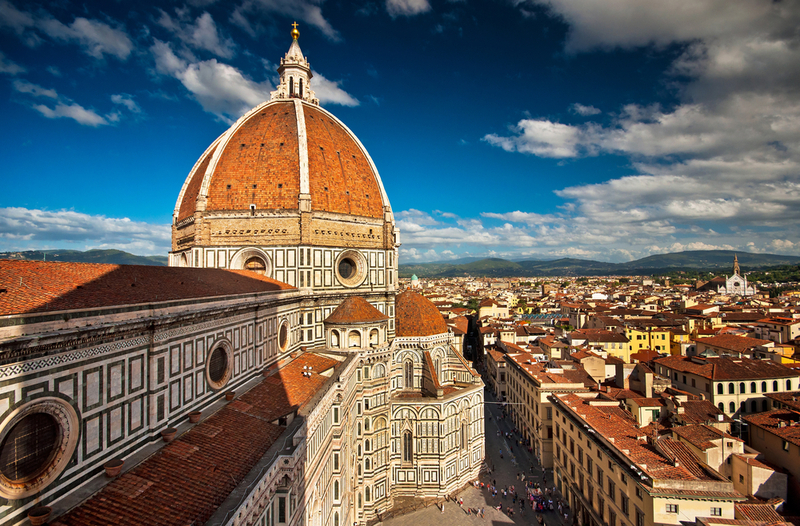 The Duomo, or the cathedral of Santa Maria del Fiore, is an iconic and well-loved landmark in Florence, Italy. But it’s more than just one of the largest churches in the world. Built over the remains of the 4th century-era Cathedral of Santa Reparata, the church has a rich history. The whole complex in its current form traces its origin to 1294. 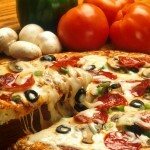 It was originally borne from a desire to catch up with the magnificent cathedrals of Siena and Pisa. To do this, designer Arnolfo di Cambio wanted to create the largest Catholic Church in the world. However, it would take until 1296 for actual construction to begin on the chosen site. And unfortunately, di Cambio died before the project was completed. So the reins of the project were turned over to famed Renaissance artist Giotto, who lent his name to one of the church’s bell towers. But the church would still not be finished during his lifetime. After Giotto passed away in 1337, the project was then passed on to a series of architects. It would take until 1380 to finish the nave or central aisle. By 1418, only the dome would remain unfinished. 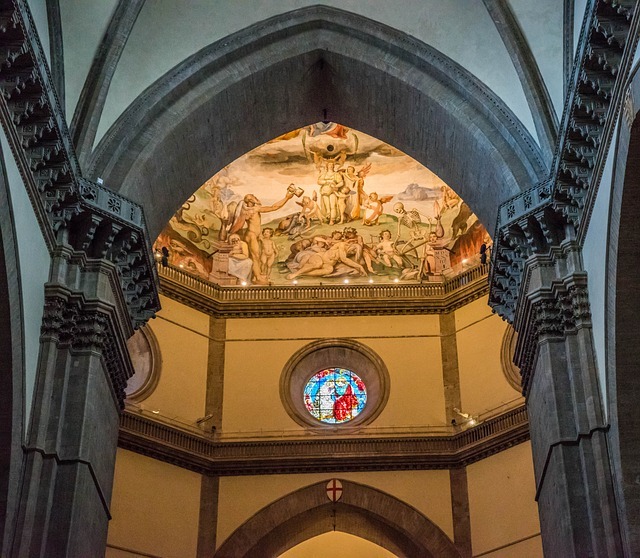 Finally, a dome design by Filippo Brunelleschi would finally mark the church’s completion in 1436—nearly two hundred years after the first stone was set. The cathedral was then consecrated within a year by Pope Eugenius IV, dedicating it to Santa Maria del Fiore (Saint Mary of the Flowers). But this would not be the end of the church’s story. In 1587, the church’s Renaissance-era façade was ordered dismantled by Duke Francisco I de Medici as a result of changing artistic tastes. It would be left plain and bare up until the 19th century. A new design by the architect Emilio De Fabris was later implemented and completed in 1887. This gave the cathedral much of the look that we now recognize it for. All that was left was the cathedral’s famous bronze doors, installed from 1899 to 1903. 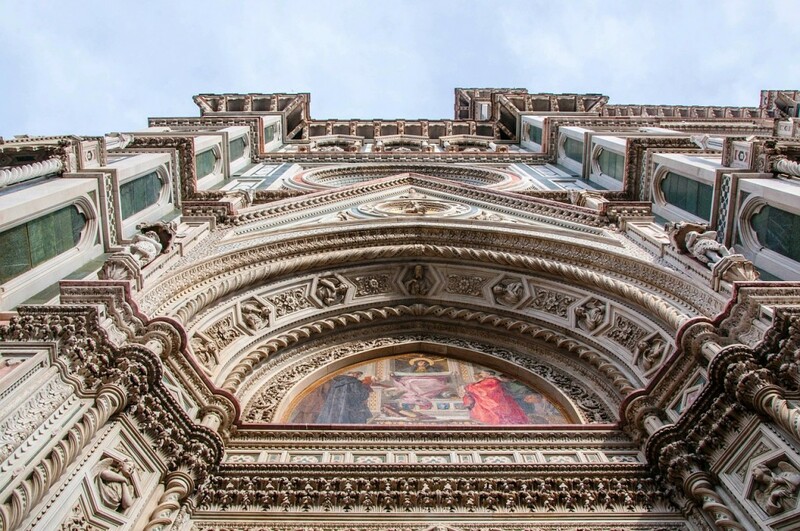 To this day, the Duomo remains an active place of worship as well as a tourist hot spot in the heart of Florence. The dome itself is an architectural and engineering marvel. During the time of the church’s construction, builders have yet to figure out a way to construct a dome without the heavy supports usually employed in medieval structures. This made it one of the most ambitious projects of its time. Inspired by the Pantheon in Rome, Brunelleschi utilized a girdle-like support structure and developed new building technologies to finally finish the church. The result is a truly magnificent structure and one of the most recognizable landmarks in the skyline of Florence. But the dome isn’t the only thing remarkable about the church. You can also appreciate the structure’s fresco-covered interiors. These were painted by other Late Renaissance artists Giorgio Vasari and Federico Zuccari. The most famous of these frescoes is that of The Last Judgment, which can be best appreciated by taking the climb up to the cupola for a closer view. The bell tower or Campanile is a free-standing structure within the church complex. At the top rests seven bells that were cast by various artisans of the 18th and 20th centuries. Each bell has a name. The older bells include “Campanone” (the largest bell, created in 1705 by Antonio Petri of Florence), and “La Misericordia” (or “Mercy Bell,” created in 1830 by Carlo Moreni). However, the last four bells possess a more modern origin, being cast from the damaged remains of their predecessors. These include “Apostolica” (the “Apostolic Bell,” created in 1957), “Annunziata” (1956), “Mater Dei” (or “God’s Mother Bell,” cast 1956), “L’Assunta” (1956), and lastly, ”L’Immacolata” (1956). Meanwhile, various reliefs and sculptures can be found on the exterior of the bell tower. These tell the stories of the creation of man and woman. They also highlight various activities and professions such as sheep-herding, music, metallurgy, weaving, and wine-making. Images that depict astrology, engineering, and other scientific endeavors can also be spotted across the campanile’s exterior. Additional images include that of the then-seven known planets. These are then matched with the cardinal virtues, the theological virtues, various liberal arts, and the seven sacraments. There are also niches which house the statues of various characters such as the Kings of Israel, pagan priestesses, prophets, and patriarchs. 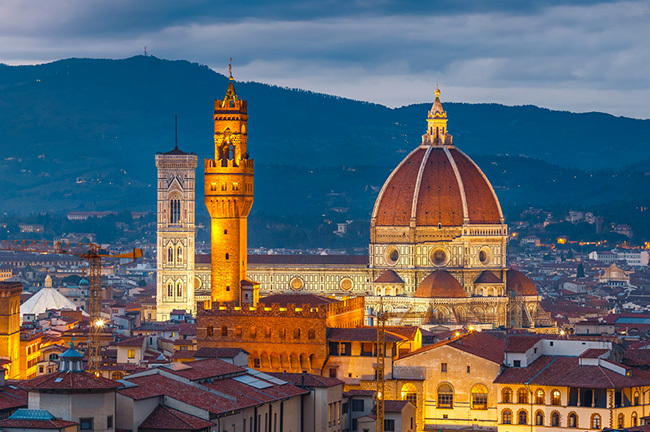 Though difficult to reach, the top floor of the bell tower will reward visitors with fantastic panoramas of the city Florence. The sight is more than enough to make the climb well worth the effort. The Baptistery is a smaller, separate building within church grounds that was constructed more than two centuries before the main basilica itself. Octagonal in shape, it is one of the oldest buildings in the city and is recognized as a minor basilica. Since its construction, many figures of Renaissance-era Florence were baptized here. This included members of the Medici family as well as the poet Dante Alighieri. It is also best-known for its three sets of bronze doors which are decorated by a variety of relief sculptures. The north and east doors were created by Lorenzo Ghiberti, while the south doors are credited to Andrea Pisano. n includes a variety of artworks and other artifacts, from paintings and miniatures to entire pulpits. Of particular interest in this collection is the famous sculpture of the Pietà by Michelangelo. The cathedral’s 44 stained glass windows, which were part of a project that was considered as the largest of its time in Italy. It mainly features saints and figures from the Old and New Testaments. The windows are the collective work of some of Florence’s greatest artists. They include Andrea del Castagno, Paolo Uccello, Donatello, and Lorenzo Ghiberti. Meanwhile, the drum of the dome’s cathedral features circular windows designed by Gaddo Gaddi that show Jesus Christ and the Virgin Mary. Right above the main door is the famous clock face that was painted by Paolo Uccello. It features the frescoes of the four Evangelists of the New Testament. But why is this fully functional clock only have one hand? This is because it is a liturgical clock shows the 24 hours of the hora italica (Italian time), which resets every sunset. It was broadly used as a measure of time until the 18th century. The collection of 15th and 16th-century busts. These include one of Giotto by Benedetto da Maiano, one of Brunelleschi by Buggiano, as well as busts of Marsilio Ficino and the famous organist Antonio Squarcialupi. The 15th century painting “Dante Before the City of Florence” by Domenico di Michelino. This fascinating work of art features scenes from the Divine Comedy interspersed with beautiful scenes of the city of Florence. The Altar of Saint Zenobius which houses the urn and relics of the first bishop of Florence. Its bronze shrine was crafted by Ghiberti around 1440. Meanwhile, above the shrine is a painting of the Last Supper by Giovanni Balducci. A painting of the “Equestrian Statue of Niccolò da Tolentino” by Andrea del Castagno. Similar to Uccello’s earlier fresco of John Hawkwood, this painting was also later transferred onto canvas. However, this fresco is painted in a more richly-decorated manner, giving the impression of movement. During the 1960s and 1970s, the cathedral grounds were subject to several excavations. These unearthed the subterranean vaults that were used for the burial of prominent Florentine citizens, politicians, and clergy. Among the artifacts found were remnants of streets dating back to early Christian times and the remains of Roman houses. Interestingly, the ruins of the former Cathedral of Santa Reparata were also found, along with its crypts. 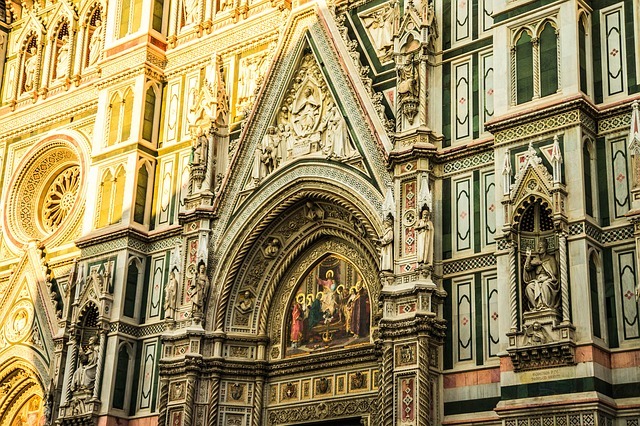 Archeologists even found the tomb of the architect Brunelleschi himself. Other notable burials include those of Giovanni Benelli, Giotto di Bondone, Saint Zenobius of Florence, John Hawkwood, Pope Nicholas II, and Pope Stephen IX. Though admission to the cathedral itself is free, there is a fee of EUR 3 to visit the crypt, EUR 8 for the dome, and EUR 8 for the tower. 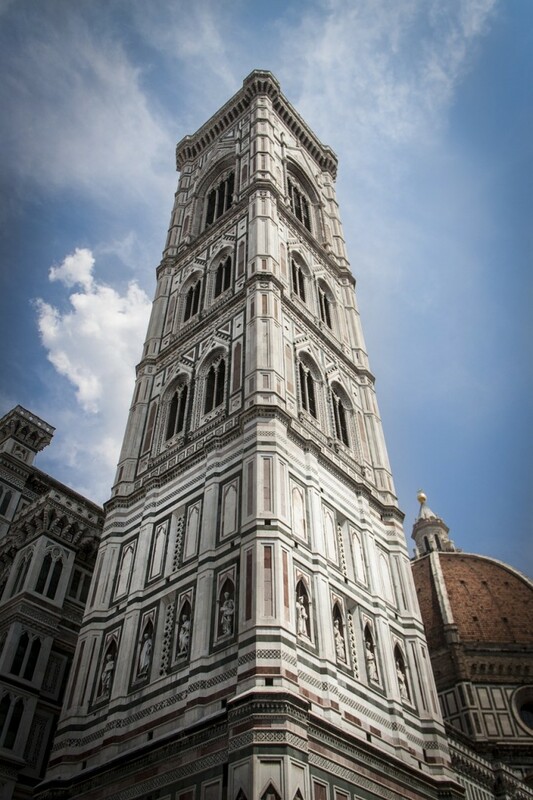 For guided visits, admission is EUR 9 for the Duomo, EUR 11 for the dome (entrance fee included), EUR 9 for the crypt (entrance fee included), and EUR 15 for the terrace (dome included). The guided tours take about an hour on average. There is also a ticket being sold for EUR 10 that allows you to visit all the sights within the Duomo group of attractions. This includes the Galleria dell’Opera del Duomo, the Crypt of Santa Reparata, the Baptistery of St. John, and Giotto’s Bell Tower. But take note that the ticket must be used within six days and once you use it, you have 24 hours to visit all the attractions. This means that if you visit just one or two in a day, you will have to purchase new tickets for the next day. Touring all the areas of the Duomo can be tiring. This is especially true for the bell tower. If you don’t think you’ll have the energy to make your rounds in a single day, it may be better for you to purchase tickets to each attraction separately. Be aware that the Duomo may be closed for tours on religious and national holidays. These occasions include January 1, Epiphany, Holy Week, August 15 (Ferragosto), September 8 (Feast of the Nativity of the Virgin Mary), November 1, Monday to Tuesday of the first week of Advent, Christmas Day, and December 26. The schedule of the Duomo and its attractions are as follows:Church – Mondays to Fridays, 10:00 am to 5:00 pm, except Thursdays. From November to April, it closes at 4:30 pm on Thursdays; from May to October, it closes at 4:00 pm.On weekends, it is open on Saturdays from 10:00 am to 4:45 pm. On Sundays, it opens after lunch at 1:30 pm and closes at 4:45 pm. It is possible to enter the premises right before closing.Cupola/Brunelleschi’s dome – Mondays to Fridays, 8:30 am to 7:00 pm. 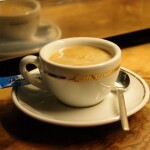 On Saturdays, from 8:30 am to 5:40 pm. It is closed to the public on Sundays. Last entry is at 40 minutes before closing.Santa Reparata Crypt – It is open during the same hours as the church, but is also closed off on Sundays. Last entry is at 30 minutes before closing.St John’s Baptistery – It opens at 11:15 am and closes at the same time as the church, except on Sundays when it opens at 8:30 am and closes at 2:00 pm. For those who wish to attend mass, the schedules are as follows:Sundays – 7:30 am, 9:00 am, 10:30 am (the mass will be in Gregorian chant), 12:00 pm, 6:00 pm. Vespers with chants are also held at 5:30 pm.Mondays to Saturdays – 7:30 am, 8:30 am, 9:30 am, and 6:00 pm. On Saturdays, masses in English are held at 5:00 pm in the church. The venue of the mass is moved to the Misericordia on Piazza Duomo on every first Saturday of the month. If you plan to visit Brunelleschi’s Dome and Giotto’s Bell Tower, wear comfortable shoes and be ready for an intense workout. There are 463 steps to the top of the dome, while there are 414 to go up the bell tower. Each attraction might take you about an hour to reach the top. The best times to climb these structures would be either early in the morning or late in the day when it’s not too hot. IMPORTANT HEALTH WARNING: Unfortunately, accessibility to the dome and the bell tower will be an issue for persons with disabilities. As old structures, neither of these attractions have elevators or lifts. There are also balconies along the way that may cause panic for those who have a fear of heights. Going up the stairs, there are also points where the stairway become very narrow, possibly causing problems for people with claustrophobia. People who have had a recent operation and those with vertigo or heart problems are also discouraged from attempting to visit these attractions. Lastly, remember that the place is still an active place of worship. Make sure to dress appropriately and keep your voice down to avoid disturbing any worshippers.